This year, as in any given year, many high profile people have been dropping like flies – Etta James, Mike Wallace, Whitney Houston, Maurice Sendak, Andy Rooney, Donna Summer, Maurice Gibb, Davy Jones, to name some names. Me: Holy crap, I’m next! 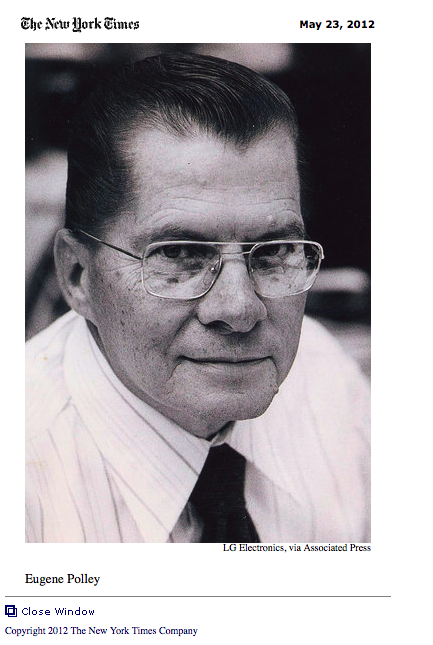 The death that has interested me most thus far this year is that of a relatively low profile man who was many decades my senior, an inventor named Eugene Polley. In an obituary written by Margalit Fox that was published in The New York Times, she states that Mr. Polley was, “ … an inventor whose best-known creation has fostered blissful sloth, caused decades of domestic discord and forever altered the way consumers watch television … Mr. Polley, the inventor of the wireless television remote control, was 96.” Hey, my kind of guy. In 1955 he invented the Flash-Matic. 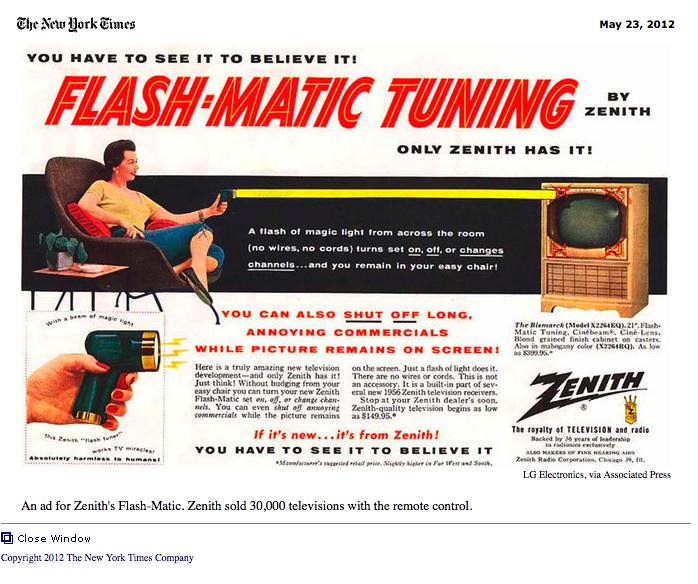 The ad states that pricing for Zenith brand televisions “begin as low as $149.95” or $1,267.40 in today’s dollars. The set pictured in the ad in the “blond grained finish cabinet on casters” costs $399.95 or $3,380.43 in today’s dollars. What bargains. The median salary in 1955 was $4,418 or $37,341.53 in today’s dollars. Once again Lame Adventures is flaunting its vast educational muscle if one overlooks the redundancy of the phrase, “in today’s dollars”. Although Mr. Polley’s invention did not fly off store shelves, I doubt that 99% of US households had a single TV in 1955 much less that the average household had 2.24 sets as the households of today. 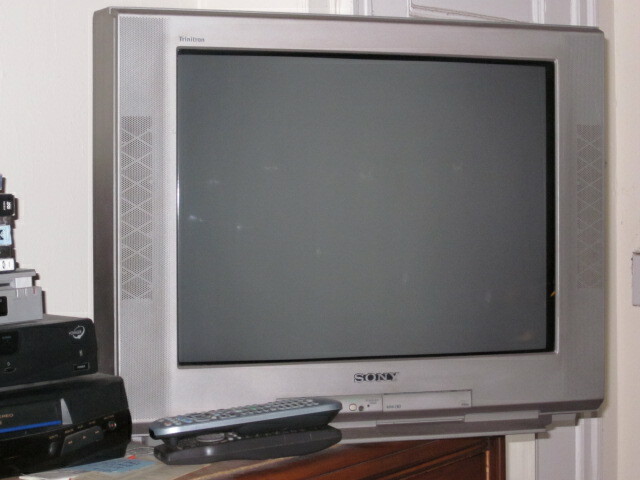 Since I watch on average two hours of TV a week (exceptions that I avidly tune in: Wimbledon and US Open tennis, the Academy Awards, the Tony Awards, election night results, and on those rare occasions when Saturday Night Live sounds like it might actually deliver), my eleven-year-old Sony behemoth qualifies as a .24 set. Sony .24 set circa 2001 (note remotes in foreground). This is not to imply that I’m a snob that considers TV beneath me. My preferred mode of procrastination is the Internet. The Flash-Matic allowed the TV viewer to turn the set on, off, change channels and mute the sound of commercials – something that I personally highly appreciate. Thank you Mr. Polley. Ms. Fox describes Mr. Polley as “a plain-spoken man who seemed to avail himself of his own internal mute button only rarely”. His being a chatterbox further endears him to me. Mr. Polley indulged in whining about shoddy reporting that often credits his colleague, Robert Adler, who invented a better selling remote, as being the sole inventor of this device. Not so! Therefore, I conclude that the visage of this founding father of the wireless remote should grace a new coin, at least the two-cent piece. This entry was posted in Humor and tagged eugene polley, flash-matic, inventors, obituary, remote control, television, the new york times, TV. Bookmark the permalink. This is so funny! Who knew? I think he is up there with Thomas Edison and the inventor of the barcalounger! I haven’t read the obits in a long time now because they started to depress me too much. But I used to scour them regularly too. So thank you for sharing the story of Mr. Polley, he sounds like he would have been a great guy to have a beer with. And I will happily second your motion for putting his face on a coin. He earned it!! I realize that he’s not in the league of your Hot Dead Guy selections, but he certainly was a man of vision. Truly coin-worthy! How funny that you started reading the obituaries at such a young age. But Mr. Pollley was defiitely worthy of this fine profile.. And 2,24 televisions per household? Never seen one of those .24 sized tvs. The Times obits hold their own with some of The Old Gray Lady’s most inspired writing. I admire your excellent tribute to Mr. Polley and his original invention. An invention that reigns supreme amongst the men-folk in your household BatPat! I remember my father’s first remote control. I *think* it may have been connected by a wire though, and he got it at some point in the 60s or 70s. It was “mechanical” in that pushing the button on it simply served to activate a mechanical “turner” that covered the normal dial that you would turn to clunk from one station to the next. You’d click the button and it would “clunk” from channel four to channel five, etc. He was SOOOOOO pleased with that thing! Even though the one your dad had sounds jerry-rigged, we never had one when I was growing up. Looking back, I was one of those hyperactive kids that was always running around like a loon. I had no problem getting up and changing the channel. Hm, maybe I was my family’s remote control? While I’ve never really scoured the obits, since sometime in my twenties, I’ve paid attention to the age of well-known people who died unexpectedly. When they died due to their own fault, such as bungee-jumping or a drug overdose, I felt a bit of a sigh of relief, as those are the sort of thing you can prevent. It’s the ones that seemingly drop dead for no reason that scare the heck out of you. Yes, someone my age checking out spontaneously guarantees completely freaking me out Dan. Hey, thanks for visiting! Hmm, interesting that only one remote can control the TV, but I suppose dueling remotes would up the homicide count. When I visit my buddy, Martini Max, I glue my mitts on his remote to ensure I’m not force fed any Laurel and Hardy or Abbott and Costello he’s DVR’ed. I loathe them almost as much as Jerry Lewis. Max is cool, he knows what I’m up to, and lets me get away with it. Probably if more guys were like him the divorce rate would plummet. Back in the Dark Ages of the ’50s and ’60s, there weren’t that many TV channels so not having a remote wasn’t too big a deal. My ex-husband used to lie on his back on the floor in front of the TV and turn the dial with his toes. He was very talented that way. Much like J. Fred Muggs. You raise a good point. Until the advent of a million channels on cable, I did not feel an iota of need for a remote. Thanks for sharing the flattering portrait of your ex. Are you aware that not only is J. Fred still alive, he hit 60 this year? Wow. Five more years and he qualifies for Medicare. I qualify on June 3rd. I’m sure J. Fred has a better pension plan than I do, too. My parents got married on your fourth birthday — when you were just a budding loveable cynic! I know I am not your ex-husband, but maybe if Einstein was right I could have been. You see, I used to do the same thing with my family’s big TV console. Our channel knob had broken by 1968 so my dad fixed it with a bolt and a bunch of nuts. It was hard on the toes but it toughened me up. I also learned to write with my feet. I was humbled, though, some 20 years ago when I met a gentleman in Sacramento who was born without arms and he played the guitar with his feet. He had just played for the pope. And I can only write my name! My signature has taken such a downhill slide, maybe I should learn how to start writing it with my feet. Mr. Polley made us all a little more roly-poly. I’m going to name one of my love handles after him. Now that’s inspired thinking Jess! Thank you for sharing that nom de handle with us here in Lame Adventure-land.